Platinum Brushed Finish Matching Wedding Rings — Form Bespoke Jewellers Ltd.
It’s always lovely when customers come to us looking for matching wedding rings – complimenting one another but uniquely designed to each person’s style. Both rings are cast into platinum with a brushed finish. The couple were thrilled with the final look of their bespoke matching wedding rings. 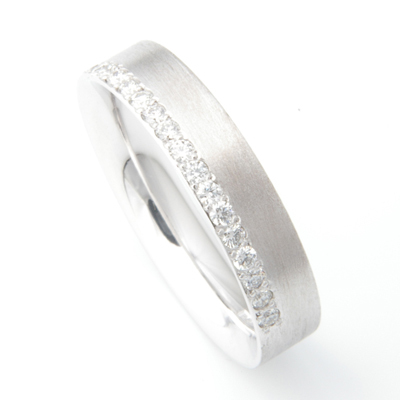 HERS: a flat court profile, half diamond set with round brilliant cut diamonds. HIS: a square court profile with rounded edges and a diamond cut line around the circumference.